ESL Students Go to the Market! While studying about markets, ESL students at the Mary D. Lang Kindergarten Center were surprised when they entered their classroom one morning to see it had been transformed into a working supermarket. Imagine the excitement for students to see vegetables, fruits, bags, boxes, and even a cash register awaiting their exploration! The sweet sounds of students singing songs about vegetables and baskets in English is only matched by the whir of the pretend cash register! Students were introduced to money, English vocabulary words surrounding a supermarket, and also using conversational phrases such as, “How may I help you?” “Did you find what you were looking for?” “How much does this cost?” In particular, students learned how to interact in a store setting. They used appropriate volume, eye contact, and dialogue. Mary D. Lang Kindergarten Center is participating in annual Earth Day celebrations by vowing to take care of our Earth and keep it clean! At the monthly spirit assembly, students were given a lesson in reducing, reusing, and recycling. At Mary D. Lang Kindergarten Center, we do not just talk about what we will do, we all put our words into action! Students and staff are actively starting seeds in their classrooms to plant in raised bed gardens located outside of the school’s playground on Cedar Street. The school’s Guidance Counselor, Mrs. Kourtney Phillips and the Helping Hands Committee, are cultivating this initiative. Students are so excited to help their community. All of the food that is harvested will be incorporated into the lunches at school when it is harvested. Math classes at the Mary D. Lang Kindergarten Center have become a little chatty this year. With guidance from the University of Delaware, teachers were trained on how to give students the time, opportunity, and ability to think about numbers using the Number Talk model. Students follow a routine during each 10-minute session: They are given an image to look at. The images increase in difficulty and vary depending on the skills desired as the year progresses. The students are then given a few quiet moments to think about what they have seen. After everyone has an opportunity to formulate their thoughts, the fun begins! Students offer their explanations (talking about numbers) of the number of dots they saw. They record their responses on paper, on small whiteboards, or on the classroom’s whiteboards. The increase in the students’ computation skills as a whole has proven that giving students time to think about numbers is an effective strategy. Students at the Mary D. Lang Kindergarten Center are getting a boost to their educational programming this trimester. Parents were given an opportunity to enroll their kindergartners in a 10 week STEM (Science, Technology, Engineering, and Math) program being taught by Ms. Jennifer Daveler and Mrs. Marie Lawson. During each hour and 15 minute session, students will be engaged in exploration, planning, and problem solving activities. Through the activities, students will gain a better understanding of pushes and pulls. Students will be able to use the skills they acquire through the Kindergarten Project Lead the Way program in elementary school and beyond. Project Lead the Way currently offers five distinct programs in 8,000 schools nationwide. 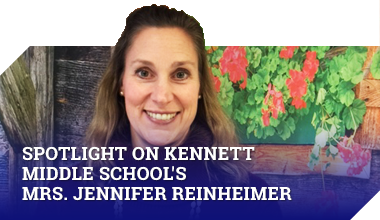 The Kennett Consolidated School District is proud to be one of those schools. Read Across America Comes To MDLKC! The Mary D. Lang Kindergarten Center is gearing up for a week of Seussical fun! Monday, 2/29 – Cozy Up to a Good Book- Wear your pajamas! Tuesday, 3/1 – Fox in Socks- Wear crazy socks! Wednesday, 3/2 – Dress as Your Favorite Character! Thursday, 3/3 – Thing 1 and Thing 2 Day – Wear a crazy hat or crazy hair! Friday, 3/4 – Funky Friday – Wear mismatched, backward, or silly clothing! Kindergarten registration for the 2016-2017 school year will begin on Tuesday, March 1 and continue through Thursday, March 31, 2016, with the exception of March 21 through 25. Parents can pick up a registration packet at the main office of the Mary D. Lang Kindergarten Center after February 15, 2016. Parents new to kindergarten for the 2016-2017 school year are invited to the Mary D. Lang Kindergarten Center’s “Kindergarten Kickoff” for an information session and building tour to be held at the Kindergarten Center on Thursday, March 3, 2016, for parents whose last name begins with A – M and on Thursday, March 10, 2016, for parents whose last name begins with N – Z. 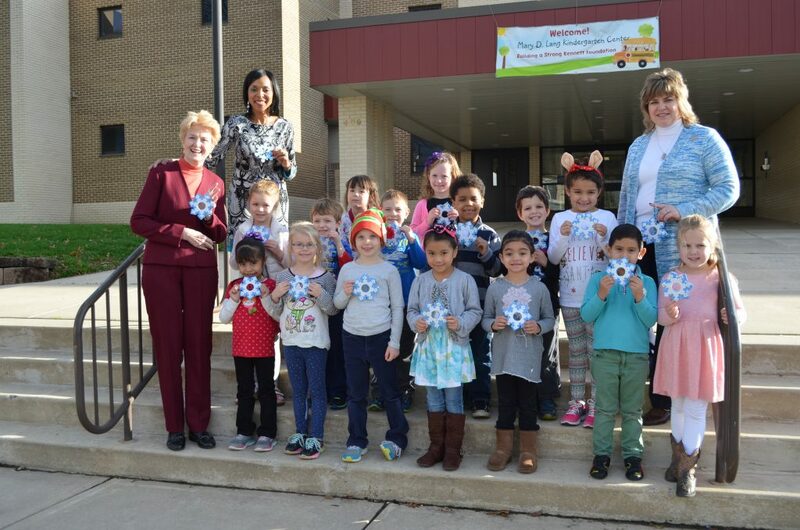 Both sessions will begin at 6:30 p.m.
Students from Mary D. Lang Kindergarten Center made 294 snowflakes for the Kennett Area Senior Center in a recent project called Snowflakes for Seniors. Together, students created a Winter Wonderland that was not only exciting, but rewarding, because students had the opportunity to do something special for their fellow community members. The snowflake crafts made by the students were used in collaboration with the Kennett Area Senior Center’s annual holiday appeal. This appeal is sent to the senior center’s donors requesting a donation to support the work of Kennett Area Senior Center. For each gift of $100 or more, one of the student’s snowflakes was hung from the ceiling of the Kennett Area Senior Center creating a blizzard throughout the building. Founded in 1972, the Kennett Area Senior Center is a private community-based charitable organization, whose mission is to preserve and enhance the dignity and well-being of adults 50 years of age and older who live in more than 13 municipalities in southern Chester County (and beyond). The Kennett Area Senior Center is located at 427 South Walnut Street, Kennett Square, 19348. To learn more about the Kennett Area Senior Center, interested readers should visit the senior center’s website, call the senior center at 610-444-4819, or stop by during normal business hours.